There She Blows! A Visit to New Bedford Whaling National Historical Park! - Super Inky! Hello my friends! I'm reporting from New Bedford, Massachusetts. New Bedford is famous for being an important location in the whaling trade. I know, whaling is so, so sad - but it's still important to learn about the history of the whaling industry. This summer is an especially important time to visit National Park Service sites because this August marks the 100 year birthday of the National Park Service! 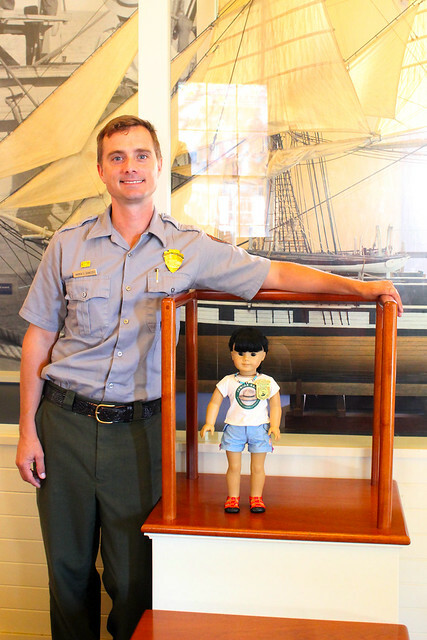 My first park this August was New Bedford Whaling National Historical Park. It's a really cool park! The park is in historic New Bedford, Massachusetts. There is a visitor center and a bunch of buildings you can visit. 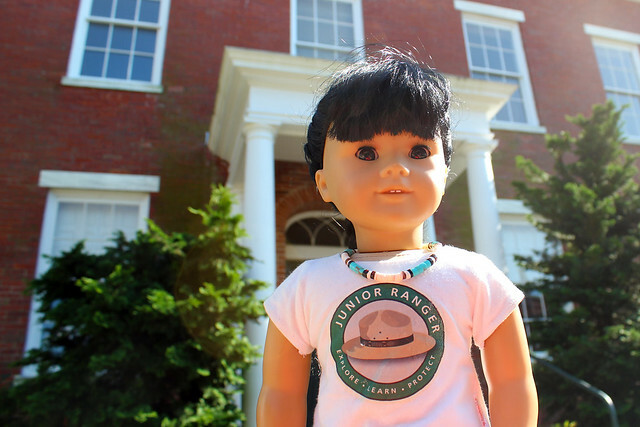 After picking up my Junior Ranger booklet, my parents and I began our walk around New Bedford. 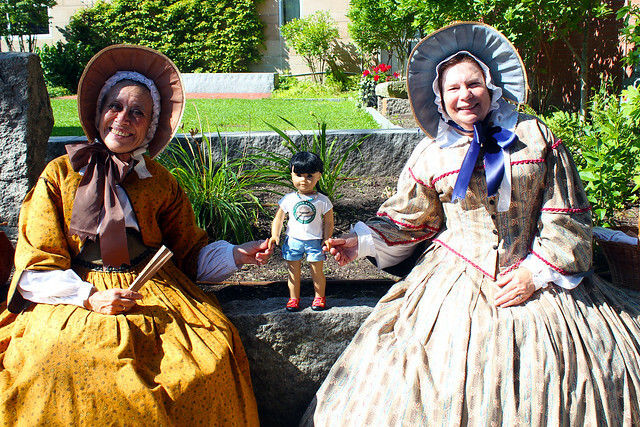 Just outside the visitor center, we encountered these two nice ladies! Their husbands are whalers and they told us what it was like to be women back in the whaling days. They were very vocal about women's suffrage- or the right of women to vote! I loved meeting them, but I'm glad I don't have to wear so many clothes in the heat! 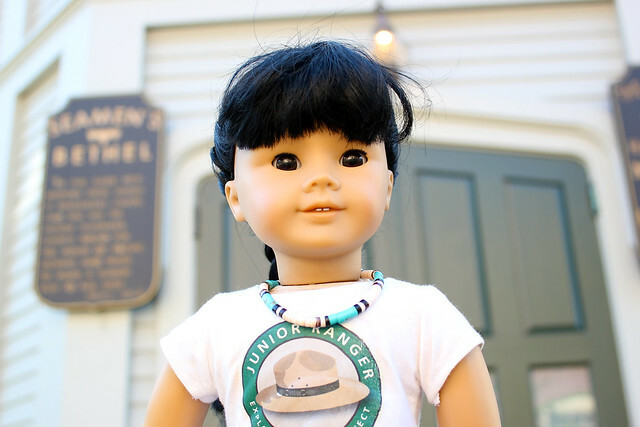 One of the stops on the tour of New Bedford that Junior Rangers take is the New Bedford Whaling Museum! 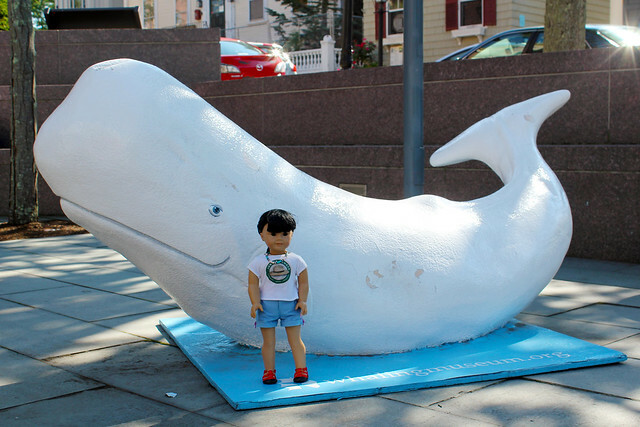 The first photo in this post- me with the white whale- is outside the museum. This photo is at the museum too! 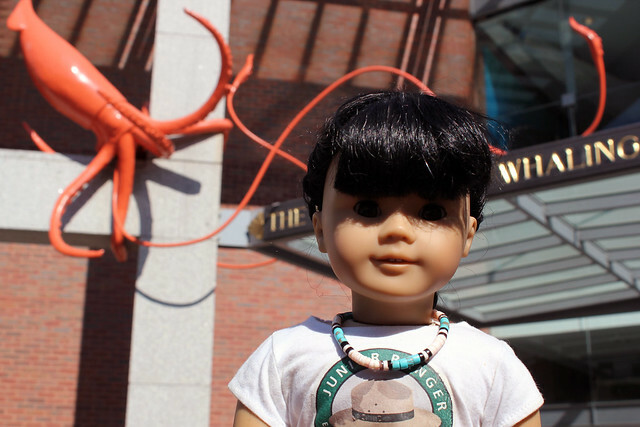 There is a giant squid climbing the front of the museum! Inside, you can learn all about the whaling industry and whales themselves. There are even really huge skeletons of whales! One thing I learned is that whalers were hunting whales to make products from their body parts. Before electric power, many people lit their homes whale oil lamps! Whoa! Some women wore whale bone corsets. Finally, a third thing people used whales for was ambergris, which you can sometimes find in whale intestines (Yuck!). Ambergris was used in perfume and in wine. The ships that carried the whalers were pretty large with lots of men and boys aboard. Women and girls only rarely came along. In fact, the only job a woman could do on a whaling ship was shout "There she blows!" when a whale was spotted! Whaling ships killed whales by launching harpoons at them from whaleboats, which were smaller boats carried along on the ship. The whale would pull the whaleboat along until the whale was exhausted- the process was sometimes called a "Nantucket Sleighride!" It was very sad, I think. I loved seeing all the older buildings in New Bedford. I imagine that many of them were built with funds from whaling. I asked my moms to take me to New Bedford because of a song by my favorite band, The Decemberists. The song is called The Mariner's Revenge Song and it's about a young man seeking revenge for his mother's ruin and death. I really loved going to the New Bedford Whaling National Historical Park! 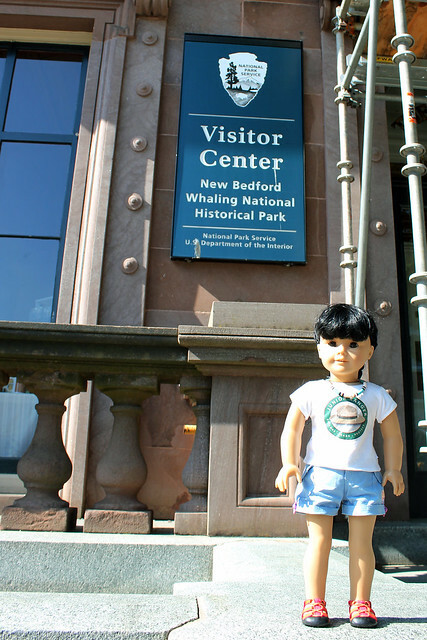 When I finished my self-guided walking tour, I headed back to the Visitor Center to receive my badge! (You can also take a guided tour, but we arrived just a bit too late for it.) After giving me my badge and helping me take an oath, Ranger Andrew and I posed in front of this whaling ship for a photo! I was so proud. I think whaling is really sad, but in the past, I don't know if people realized how dangerous it was to kill so many whales. Whales reproduce so slowly that it is very difficult for their populations to recover. Today many whales are endangered or extinct. If you'd like to learn more about whaling and New Bedford's role in the whaling industry, check out their website at www.nps.gov/nebe! What do you think, would you want to visit this National Historical Park? Looks like you had a great time, Inky! Yes I really really want to visit there. My guardian doesn't have a car to get there. We could take the bus but my guardian spent all her travel money so we can go on vacation in October. Maybe next year. I hope you will come to our park-the Blackstone Valley. I can tell you all about the history and everything you need to know. I studied while my guardian worked. she promises to put my pictures online soon and bring me back when it's not so hot.